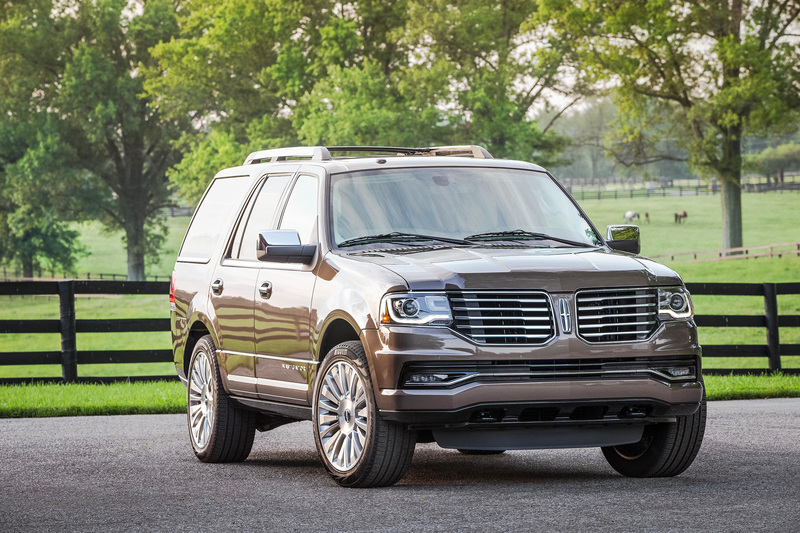 A gigantic Lincoln Navigator with a V6 engine? I couldn’t have imagined it a few years ago, but I find myself sitting in one today. While the Navigator has always come with a big, unabashedly thirsty V8 before now, Lincoln decided to drop the eight-cylinder engine in favor of one that’s more in tune with the times: a twin-turbocharged, 3.5-liter V6 for 2015. The EcoBoost does a great job mimicking a V8 in the Navigator, offering the same low-end grunt and throaty, seductive exhaust note that large-displacement American engines are famous for. A newly designed hood conceals the biggest change in the Lincoln Navigator’s history: a twin-turbocharged V6 that replaces the longstanding V8 engine. Even better, it outperforms the old V8 by a noticeable margin. Horsepower is up to 380 and torque is increased to 460 pound-feet, all while gas mileage is improved to 22 mpg on the highway and 16 in the city — if you can believe the ratings. These EcoBoost engines are getting a reputation for burning more fuel than the window sticker would indicate. Still, who would buy a vehicle like this for the gas mileage? The new Navigator continues to offer over-the-top levels of performance and luxury. Even my long-wheelbase tester, which carried extra heft because of its extended length, accelerated like a smaller SUV and effortlessly zoomed to 75 mph before the end of freeway on-ramps. It’s fun to stomp the gas pedal and hear the engine do its best angry-lion impersonation. Of course, you can’t mention the Navigator without bringing up its arch nemesis, the Cadillac Escalade. The Caddy gets an all-new design for 2015 that makes the Navigator show its age a bit, especially on the outside body panels and to a lesser extent with the interior quality. After driving the new Escalade a few months ago, though, one thing that surprises me is that I still like prefer Navigator’s ride. The Lincoln feels softer and smoother than the Cadillac to me, and I appreciated its silky, squishy suspension setup on some long stretches of interstate highway. Third-row passengers will appreciate the Navigator’s spaciousness, too. Due to a difference in rear suspension designs, the Cadillac has a higher floor than the Navigator in back, making the Lincoln more suitable for adults in a pinch. 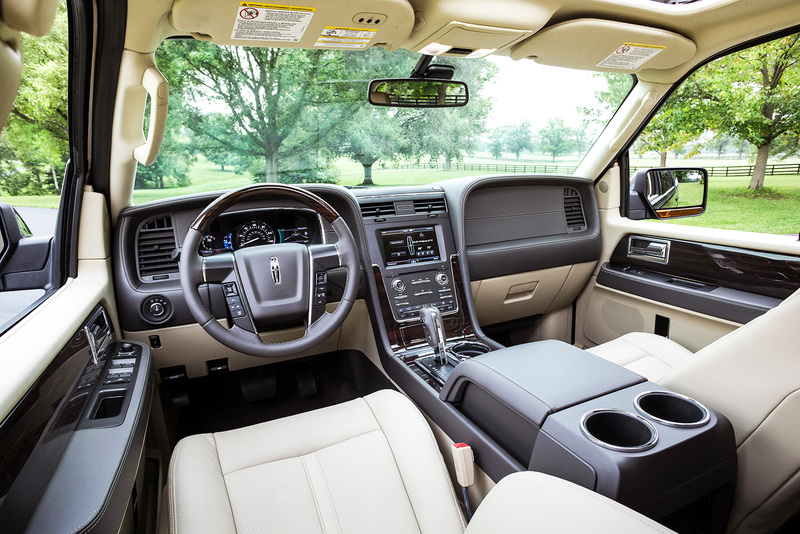 The Navigator’s cabin comes with plenty of leather and wood, giving it the upscale look that people expect from a luxury SUV. Overall, it’s a nice improvement on a tried and true design. The Navigator’s new EcoBoost engine makes it drive like a more modern SUV without compromising on power. The new engine offers spectacular acceleration, and it’s a comfortable, luxurious highway cruiser for families. Its pricing makes it look like a good value compared to some of its competitors.